The Guptas are my favourite baddies. Now, that’s a pretty big statement from someone who revels in the darkness of South African crime and who spends all his spare time reading about the wickedness that people commit. But the Gupta brothers have raised crime to a whole new level by buying and owning the upper echelons of our government - aka “state ownership”. 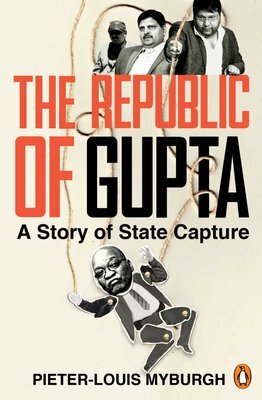 “The Republic of Gupta” is not simply a biography of the Guptas; the extent of the relationship with Jacob Zuma is unpicked and examined, and the impact of this relationship on SA is terrifyingly laid out, leaving the reader in no doubt that the scandals, the fraud, the corruption is merely the smallest tip of a very big iceberg. But does the book add anything new to what we read in the newspapers? “The Republic of Gupta” provides answers to many of the questions about the origins of the multi-billion crime wave that is the Gupta family, including where they were before they landed in SA, what their first business in SA was, and whether they were involved with other politicians prior to Zuma. Additionally, the growth of the Gupta family is examined and it is this aspect that is truly shocking – from opening a shoe shop two decades ago to buying a uranium mine in anticipation of The Nuclear Power Deal, the brothers have made an enormous amount of money very quickly. Myburgh has a keen grasp of the facts surrounding the Guptas, and presents these fairly while still building a damning case against the brothers. It is this fairness, combined with the intensive research and probing interviews forming the backbone of this book that show his skill as an investigative journalist and reassures the reader that what is presented is far more reliable than the conjecture and speculation that colour much of the reporting about the Guptas to date. The book reads like a horrifying novel; a novel that demands to be read - has to be read – so that we know the real story. Because hopefully, just maybe, it might not be too late to prevent waking up in The Republic of Gupta.